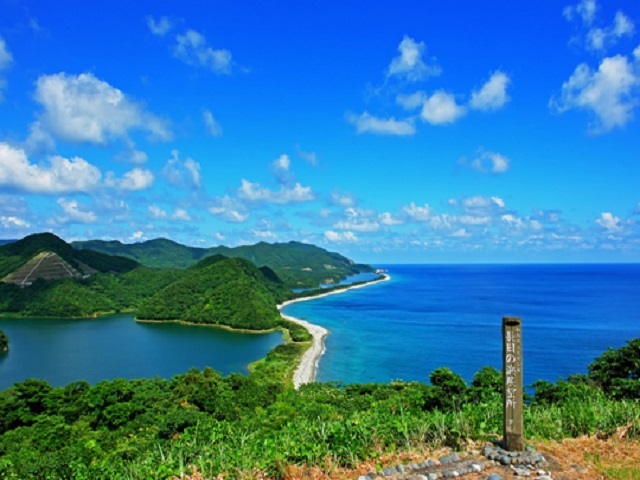 The Koshiki Islands include three manned islands and in numerable uninhabited islands which are located to the east of Kagoshima Prefecture and 45 km away to the East China Sea. What is important is that simple islanders welcome visitors above all besides the remaining unique folks created by the separated history from Kyushu mainland. There are full of outdoor sports including cruising along the shoreline, fishing and cycling. Even if you see the sea without doing anything else, it is good. It depends on you. The three manned islands are Kamikoshiki Island, Nakakoshiki Island and Shimokoshiki Island from the north and among them, the first two islands are connected by a bridge. The topography of a beautiful tombolo is seen on Kamikoshiki Island, and on the West Coast of Nakakoshik Island and Shimokoshiki Island, strangely shaped rocks of cliff extend continuously where visitors can experience cruising. There are different cruising courses from Kamikoshiki Island to Shimokoshiki Island. Therefore, a visitor had better stay at least a night one of the islands. It is a group of separated islands, there are two vessel services from Kyushu mainland, take full time to make a tour plan. Ferries from Satsumasendai Port and Kushikino Port respectively leave for the islands. Shuttle buses leave for Satsumasendai Port and Kushikino Port from JR Satsumasendai Station, so it is quite convenient. Satsumasendai Port⇔1 hour 10 minutes to 2 hours 35 minutes, depending on the sea line⇔Nagahama Port in Shimokoshik Island, one in the morning and the other in the afternoon. Special vessel service is also available from April to September. Kushikino Port⇔3 hours⇔Nagahama Port, one in the morning and the other in the afternoon. 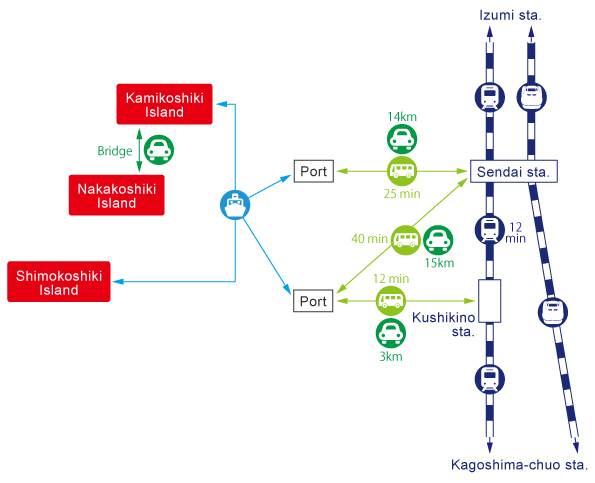 12 minutes from Kagoshima Chuo Station to Satsumasendai Station with 3 trains per hour. 45 minutes from Kagoshima Station to Satsumasendai Station.